ZULU DAWN: Britain’s Battle That Couldn’t Be Won – Schlockmania! 1964’s Zulu is a classic British example of the “guys’ movie,” a battle-against-the-odds story that salutes masculine ideals like bravery and honor. Its enduring popularity made the idea a follow-up inevitable. However, when that follow-up arrived fifteen years later in the form of prequel Zulu Dawn, it was a very different affair. Despite some surface similarities to Zulu – the same setting, the historical basis and a battle-against-the-odds storyline – it has a somber, critical mood that made this tale of days gone by feel oddly timely for a late ’70s audience. 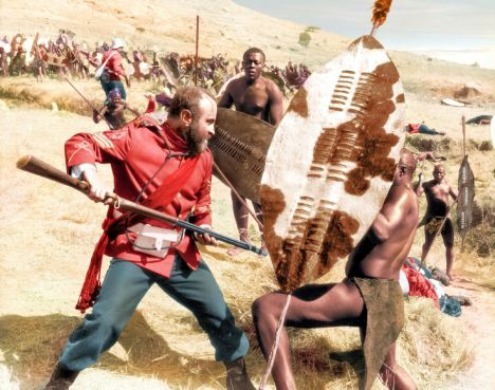 Zulu Dawn is based upon an infamous historical incident: the Battle of Isandlwana, which is considered by many to be the costliest and most embarrassing defeat in British military history. The first half of the film introduces the audience to both sides of the conflict as the British force make misguided moves in an attempt to shore up their African empire. Using a vague moral pretext, they try to impose their will on the Zulus and, when they decline to submit, the British forces ride into Zulu territory under the leadership of the arrogant Lord Chelmsford (Peter O’Toole) to declare war. Unfortunately, the British leaders have grossly overrated their military superiority. After some initial skirmishes that give them false hope, the British soldiers soon discover they have been drawn into a situation where they are hopelessly outnumbered. To make matters worse, the Zulus use guerilla tactics that short-circuit traditional battle strategies – and they are willing to fight to the death. Despite the valiant efforts of leaders like Col. Durnford (Burt Lancaster) and Cpl Pulleine (Denholm Elliott), the British soon discover that their presumption of cultural superiority don’t matter on the battlefield. 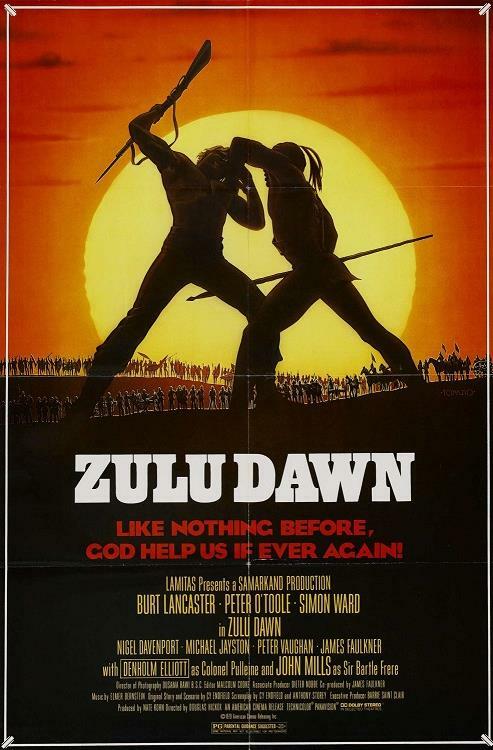 In short, Zulu Dawn is a rather subversive war movie. It’s pretty easy to read the presentation of this defeat and all the top-down miscalculations that made it possible as a critique of the Vietnam War. The script, co-written by Zulu director Cy Endfield, skillfully juggles a large cast of characters as lays out the seeds of the defeat and adds in the occasional wrinkle of dark humor (a memorable moment arrives when Pulleine doesn’t know how to pronounce Isandlwana, the territory he is about to attack). Despite the foreshadowing of doom, it also succeeds in helping the viewer understand and even like many of the British characters: the dogfaces on the battlefield are particularly sympathetic, many of whom are barely adults. Zulu Dawn further benefits from an old-fashioned sense of spectacle that adds to the film’s subversive feel. The direction by journeyman Douglas Hickox is sturdy and suitably stylish, taking advantage of real African locations and a strong cast of British actors. His efforts are bolstered impressively by a suitably regal musical score from Elmer Bernstein and superb 2nd unit direction by David Tomblin. The epic battle sequences that Tomblin masterminded are truly impressive stuff, utilizing hundreds of people to achieve a Cinemascope effect that is both dazzling and horrific at the same time. Finally, the smartly-chosen cast keeps the complex tale rolling forward with quality performances: O’Toole is a portrait of brooding arrogance, Lancaster lends a note of Hollywood gallantry as Chelmsford’s smarter but marginalized subordinate and Elliott is quietly moving as his character realizes that death is imminent while trying to retain the dignity of his values. The supporting cast is packed with similarly vivid turns: Simon Ward is likeable as a nobleman-turned-soldier who is cynical about his privilege, Bob Hoskins offers a convincingly gruff turn as a tough sergeant and Phil Daniels and Dai Bradley earn the viewer’s sympathy as brave but hopelessly naive young recruits. Simply put, Zulu Dawn is well worth seeing for viewers who can admire a war movie that uses its large-scale resources to criticize the folly of fighting a war for the wrong reasons. Despite the vintage setting, its message has a timeless quality that sadly remains all too relevant today. Zulu Dawn Trailer from Severin Films on Vimeo.